The STAP cell mess that began in January of this year has in some ways quieted down. In a broader sense, I believe that STAP is now and will be in the future viewed as a scandal that revealed some less than ideal aspects to the world of biomedical science and publishing. Where does STAP stand today? The most recent development is the publication of a new paper pointed out by a number of people to me as perhaps STAP-like. It is entitled “Electromagnetic Fields Mediate Efficient Cell Reprogramming into a Pluripotent State”. It was published in the journal ACS Nano. This Baek, et al. 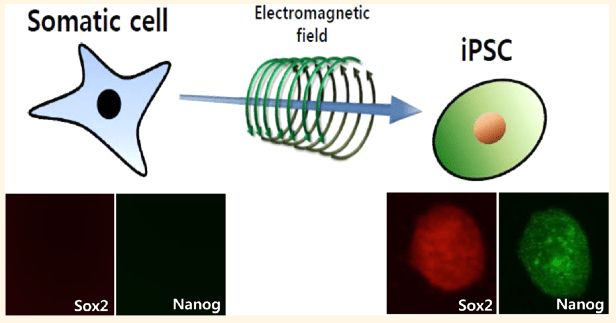 paper suggests that you can dramatically more efficiently create induced pluripotent stem cells (iPSC) by exposing somatic cells to an electromagnetic field (see graphical abstract above). My reaction? Let’s see if another lab can reproduce this, but I’m not terribly optimistic. Derek Lowe weighed in on this paper here. The Pubpeer folks have some concerns too and the authors have responded (which is a good thing) there as well. At this time, first author Haruko Obokata is faced with more immediate issues such as her future at RIKEN and her thesis. She must correct her Waseda University thesis or it may be revoked. The University did an abrupt U-turn on this as earlier they had said that while the Obokata thesis had problems it was not that big a deal. Now they are requiring a correction. Given the apparent massive plagiarism in it and re-used figures, I don’t see how a correction is possible frankly. Obokata’s former mentor at Harvard/Brigham Women’s, Charles Vacanti, recently reaffirmed his belief in STAP and along with his lab member Koji Kojima, published yet another STAP protocol this time detailing that the addition of ATP might help other labs make it work. I’m skeptical. I do find it fascinating that Vacanti still believes in STAP despite all the evidence to the contrary. Otherwise in the STAP news, it’s interesting to speculate that during his sabbatical that he may continue working on STAP. I still think that Nature has not come to terms with its role in STAP. As has been said many times, no journal, editors, or reviewers can catch all problems in a paper, but given the released STAP reviews of previous versions of the STAP papers including one at Nature that wasn’t initially accepted and received pretty harsh reviews, it sure seems the overall review process at Nature should have done better. All things considered, I kinda doubt we’ll hear anything else from the journal on STAP. If the trend of a surging number of overall retractions at Nature continues, however, there may be more of an impetus for change. Remaining STAP mystery: where did STAP cells really come from? If acid and other stressors (now perhaps including electricity) do not really make pluripotent or totipotent stem cells, then where did the alleged STAP cells/STAP stem cells come from that seemed in the mouse assays to have pluripotency or totipotency? There have been some indications that STAP cells have a different genetic make up or transcriptomic profile than they were “supposed to” as the authors reported these features in the retracted STAP papers. Were STAP cells actually a mixture of ES cells and trophoblastic stem cells? Some kind of iPS cells? We still do not know. Stem Cell Person of the Year Award 2014 Voting: Who Will Be Top 12 Finalists? Whose scandal? I think the main player of this scandal is Nature. But so far Nature has not shown any remorse over its big mistake or, more accurately, misconduct in the scientific publishing practice. look into the work of Reba Goodman at Columbia. She shows that there are EMF responsive genetic sequences in the promoters of both HSP70 and Myc in both human and mouse, which when mutated, abolish the effect of EMF which increases expression. The authors do not claim that EMF alone will reprogram, but that EMF when applied in the presences of OKSM expression, increases reprogramming. The latest news on Dr. Obokata is that she will remain with Riken, but will be demoted from unit leader to research team member effective November 21. Congrats to RIKEN for hiring a “research team member” who probably won’t participate in any research team’s work… I guess she’ll get a desk next to a window with a nice view. I guess it’s cheaper to keep her than to fire her. I’m sure they tried to intimidate (blackmail) her to resign, but there’s already been too much bad publicity, and everyone knows she has a lawyer, so this is probably the least costly alternative for RIKEN. Sorry to bother, but can you please help me settle a disagreement ? Is it your position at the end of this article that so-called STAP cells were created through some other means than the STAP procedure presented in the now-retracted papers? In other words, do believe true “STAP cells” don’t actually exist and that Obokata et al. somehow ended up with embryos developed from cell lines produced by some other means? We do not have all the facts so we cannot be sure. However, given all I know I would speculate that the “STAP cells” reported in the now retracted Nature papers were not created from ordinary cells by Obokata. Instead I imagine a scenario in which pre-existing iPS cells or ES cells were presented as “STAP cells” or “STAP stem cells” (possibly in some cases mixed (intentionally or not is unknownn) with trophoblastic stem cells (which can make extraembryonic tissues)) to other scientists on the papers who subsequently did additional studies on them (thinking they were “STAP cells”) such as the production of embryos. It’s just a theory, but I haven’t heard a more convincing one.